The city of Toronto is filled with more than 100 privately owned public spaces, or POPs for short, and a new one is set to open up at the Sony Centre next summer. It'll come at the tail-end of lengthy development project, which saw starchitect Daniel Libeskind's 60-storey L Tower rise behind the arts and cultural institution. 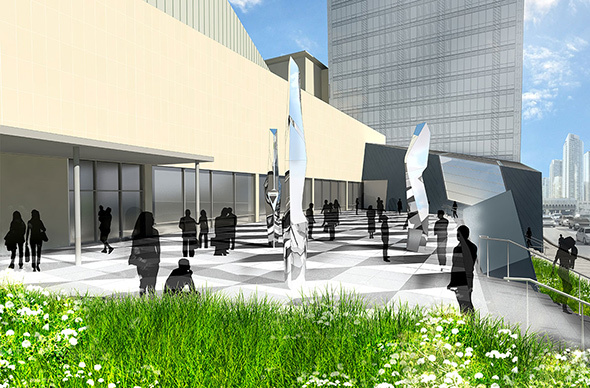 Montreal-based landscape architect Claude Cormier is designing the new plaza, which will face Front Street. As the renderings show, it'll include green space, public art pieces as well as tables and chairs. Cormier is also giving the nearby Berczy Park a dog-themed makeover. 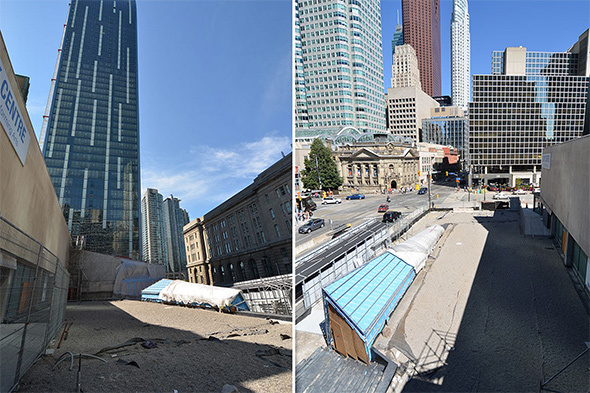 Toronto Star columnist Christopher Hume writes that the upcoming Sony Centre plaza is part of larger trend in Toronto to convert small, seemingly empty spaces into sites for civic engagement. The popular Front Street Food Market is a successful example of this type of city building, though you could cite plenty of other examples. After years of construction on Front Street, this accessible, public plaza will hopefully give the area's many residents and office workers a much needed outdoor safe haven when it opens next year.